We are please to announce the second, beta-release of the Wellcome Trust-funded IUPHAR Guide to IMMUNOPHARMACOLOGY (GtoImmuPdb). Since our first beta-release back in May 2016, we have undertaken a user-testing exercise to gather feedback on the layout, navigation and content of the resource. This blog post summarises the outcomes from the user-testing and the consequent changes in the v2.0 release. 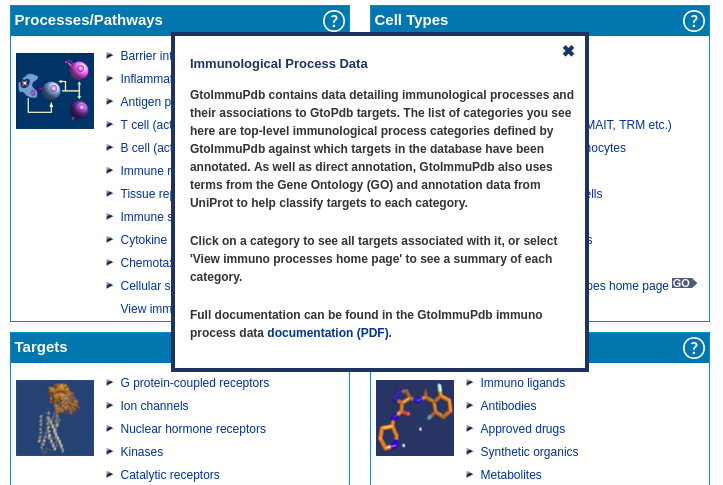 We reached out to several groups of immunology and inflammation researchers asking for anyone interested in helping us to test the GtoImmuPdb beta v1.0 release. These groups came from the British Society of Immunology, Glasgow University, the IUPHAR ImmuPhar Section and more. We set-up a google form to guide people through using the beta site and asked relevant questions about each section of the site, focussing on how easy the site was to use, how credible the data appeared to be and what features users would like to see added/removed. In total 8 paritipants compelted the testing, and these testers had a variety of research experience (PhD student to Professor) and previous experience of the using GtoPdb (from several visits a month to never having used it before). Some of the key outcomes have informed changes in the v2.0 release. Most notably, reorganisation of help documentation, altering process/cell type layouts and navigation and improving information on disease associations. Help pop-ups have been added to the main panels on the portal. This gives upfront help about what users can expect to find within each section, and how to navigate it. We believe this is easier than having to read through a tutorial or help page. Our aim will be to supplement these with short help videos, showing how to navigate the data. From our user feedback, although help was easy enough for most user to find, some comments pointed to it not always being immediately obvious what the data being displayed was and how to navigate it. We hope that by adding in ‘in-line’ help pop-ups it is easier and quicker for users to find the relevant guidance. 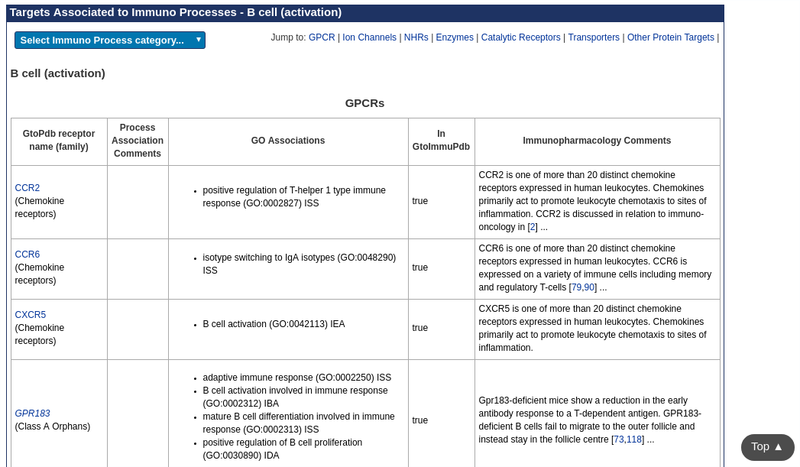 We have made some minor modifications to the layout of both the process association and cell type association pages. The navigation menus (pull-down menu and quick links to target class sections) have been swapped over. Our user-testing highlighted the need to display more information on the disease association pages, particularly about why ligands are associated with some diseases. The information displayed has been extended to show whether the ligands is an approved drug (and which regulator it was approved by) and links to more info at drugs.com. We have also added the clinical use comments for the ligand. This is all data that can be found on the ligand summary pages, but we have also surfaced into on the disease association pages to bring added value and ensure the most relevant information is available in the right places. 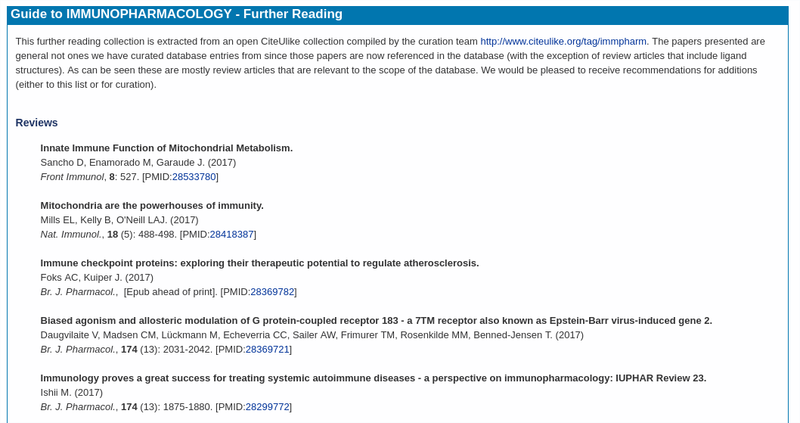 A new page has been added that presents a further reading collection extracted from an open CiteUlike collection compiled by the curation team http://www.citeulike.org/tag/immpharm. The papers presented are general, not ones from which database entries have been curated. They are mostly review articles that are relevant to the scope of the database. We would be pleased to receive recommendations for additions (either to the further reading list or for curation). Other aspects of the process and cell type data commented on during user-testing was the need for more information on GO terms, IDs and evidence; the need to incorporate curator comments about the process associations; and the absence of data for some cell type categories. Improving the content and display to meet these is a priority, but a substantial body of curatorial work. So we will be aiming to meet these needs, but not until future releases. Development of the beta-release is ongoing with regular updates planned over the next few months as the quantity of data captured increases and improvements in the site layout and function are made. As always we welcome comments and engagement with interested user groups and potential future users, so don’t hesitate to get in touch with us. This project is supported by a 3-year grant awarded to Professor Jamie Davies at the University of Edinburgh by the Wellcome Trust (WT).